"Tax reform can play an important role in greening growth. The evidence-driven simulations presented in this report of the Ex’tax Project suggest that shifting taxes from labour to consumption and natural resources will result in more growth, more employment, and a smaller environmental footprint. We have enough evidence to support green tax reform and concrete policy action." "The report 'New era. New Plan. Europe' shows us the possibilities and opportunities a fundamental shift in taxes has to offer. It is a valuable study for policy- and decision makers in businesses and governments who are looking for solutions to address the challenges of our time: climate change, pollution, inequality, unemployment and resource scarcity." "This project is a beautiful example of a new agenda for Europe." “Shifting taxes from labour to pollution, resource use and consumption can help EU countries boost economic growth, create many new jobs and achieve commitments to minimise climate change under the Paris Agreement, as well as protect constrained environmental resources." The findings of this study suggest that a tax shift from labour to natural resource use is a viable strategy to align tax systems with the goals of the Europe 2020 Strategy and the Sustainable Development Goals. This study by The Ex’tax Project in cooperation with Deloitte, EY, KPMG Meijburg and PwC examines the impact of a tax shift from labour to consumption and natural resource use. Cambridge Econometrics has modelled the impacts of a tax shift scenario in the period 2016-2020 in 27 Member States of the European Union using the E3ME macro-econometric model. Based on the modelling results, Trucost assessed the integrated impact of the scenario on financial capital, natural capital and social capital. The Ex’tax Integrated Value Added Statement (IVA) includes the financial capital value, as well as the external benefits to society in terms of social capital and natural capital. The GDP and employment results are positive in each of the 27 countries under review. In 2020, GDP levels are on average 2.0% higher and employment levels are on average 2.9% higher than in a business as usual scenario. This means that 6.6 million more people are in employment. Presenting the study ‘New era. New plan. Europe. A fiscal strategy for an inclusive, circular economy’. From left to right: H.R.H. 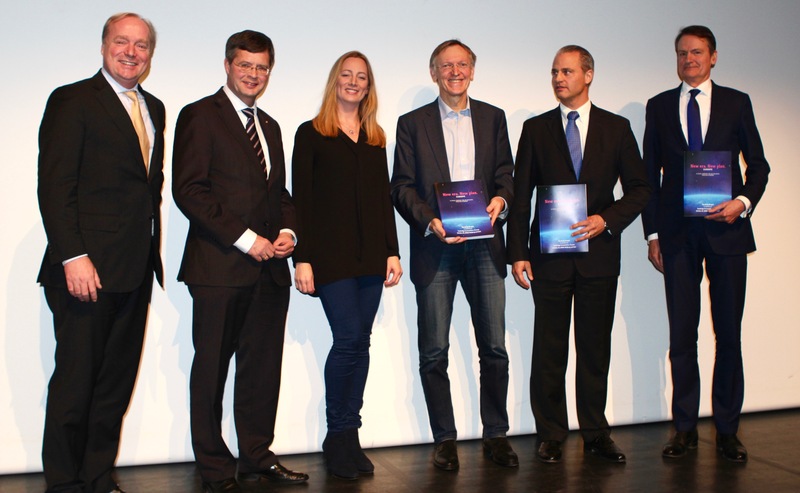 Prince Carlos de Bourbon de Parme, former Dutch Prime Minister Jan Peter Balkenende, Femke Groothuis (The Ex’tax Project), Janez Potocnik (UNEP), Steven Tebbe (CDP), Ambassador Wepke Kingma, Deputy Permanent Representative of the Kingdom of the Netherlands to the EU. Thursday, December 15th, Brussels – The European Union and EU member states would benefit from higher economic growth, more jobs and a cleaner environment if governments shifted taxation from labour to pollution, the use of natural resources and consumption. It would result in 2% higher GDP levels, additional employment for 6.6 million people, and reduced carbon dioxide (CO2) emissions of 8.2%, all by 2020. These are the findings of an extensive study ‘New Era. New Plan. Europe. 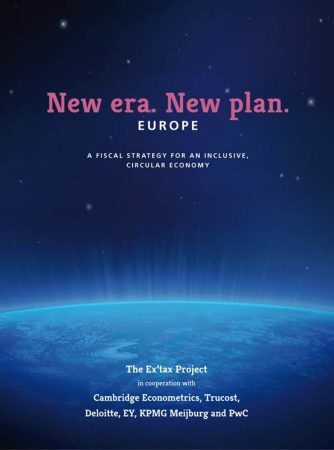 A fiscal strategy for an inclusive, circular economy’ presented today in Brussels by The Ex’tax Project Foundation, in cooperation with Cambridge Econometrics, Trucost, Deloitte, EY, KPMG Meijburg & Co and PwC. The study was presented in Brussels today by H.R.H. Prince Carlos de Bourbon and former Dutch Prime Minister Mr. Jan Peter Balkenende. They symbolically offered the report to Ambassador Wepke Kingma, Deputy Permanent Representative of the Kingdom of the Netherlands to the EU, and Steven Tebbe, Managing Director of CDP Europe. The study presents a tax shift scenario that matches EU aspirations to simplify tax systems and relieve the tax burden on labour in each of the 27 EU Member States under review. Cambridge Econometrics was asked to model the macro-economic effects of this scenario across the European Union using the E3ME model. The key message from the results is that it is viable to design a policy that reduces resource use and carbon emissions, while at the same time stimulating the economy and creating jobs. The Ex’tax Project is an independent foundation that strives towards a fundamental tax shift from labour to natural resource use. The foundation raises support and creates alliances and practical tools that help advance the implementation of such a tax shift. Cambridge Econometrics provides data-driven analysis and interpretation to policymakers at local, national and international levels. The company’s bespoke models highlight trends and estimate impacts based on real-world outcomes, rather than unrealistic theories. Cambridge Econometrics economists work with organisations around the world, providing in-depth assessments of specialist topics and cross-sector overviews. Trucost provides sustainability data and insight to drive resilient, profitable business models and investment strategies – and identify the transformative solutions of tomorrow. Fields of expertise: capital markets corporate advisory, policy & research.